The North End Communities consistently identifies affordable quality housing as an overall rental strategy. Our programs cultivate a sense of pride and community ownership in the unique neighbourhoods. Throughout 2012, NECRC has worked to support the communities of William Whyte and Dufferin in creating new five-year housing plans that would outline the vision the communities have for the future of their neighbourhoods. The consultation process, carried out by award winning planning firm BridgemanCollaborative Architecture under the direction of the William Whyte Residents Association and the Dufferin Residents Association of Winnipeg, was extensive in its efforts to gather community feedback and the resulting housing plans are guiding documents that reflect the likes and dislikes of local residents and presents the information in a clear and easy to understand format. Click the links below to see the 2013-2018 William Whyte and Dufferin Neighbourhood Housing Plans. For more information on the consultation process and the creation of the Dufferin and William Whyte Housing Plans, click on the Appendix below. The North End Community Renewal Corporation is partnered with Manitoba Hydro to help North End property owners access energy efficiency upgrades to lower their utility bills and improve their quality of housing. While Manitoba Hydro’s Neighbourhood Energy Efficiency Project is open to both owner-occupants and landlords across Manitoba, NECRC’s Energy Efficiency Upgrade Coordinator will work with North End property owners to make accessing energy upgrade resources even easier. In addition to the economic benefits of lowered utility bills and the quality of life benefits of a warmer home, Manitoba Hydro and NECRC are supporting the local economy and North End jobs by partnering with local social enterprise Building Urban Industry through Local Development (BUILD) to carry out the energy upgrades. The Energy Efficiency Upgrade Coordinator can assist North End property owners with every step of the application process including filling out application forms and gathering required documents from homeowners and tenants, scheduling energy audits, and arranging for and meeting with the contractors doing the work. Qualifying homes will receive free insulation upgrades (approximate $4,000 value), a new high-efficiency natural gas furnace installed for only $9.50/month for 5 years ($570 total cost) or a $3,000 rebate towards a high-efficiency natural gas boiler, and a free in-home energy efficiency review and energy savings items (low flow shower head, faucet aerators, and energy efficient light bulbs). For more information please contact NECRC’s Energy Efficiency Upgrade Coordinator, Deborah Epps, by phone at 204.998.7297 or by email at deborah@necrc.org. The Exterior Home Improvement Program (EHIP) is an Exterior Fix-Up Grant Program that aims to improve a property’s exterior quality, safety and appearance. 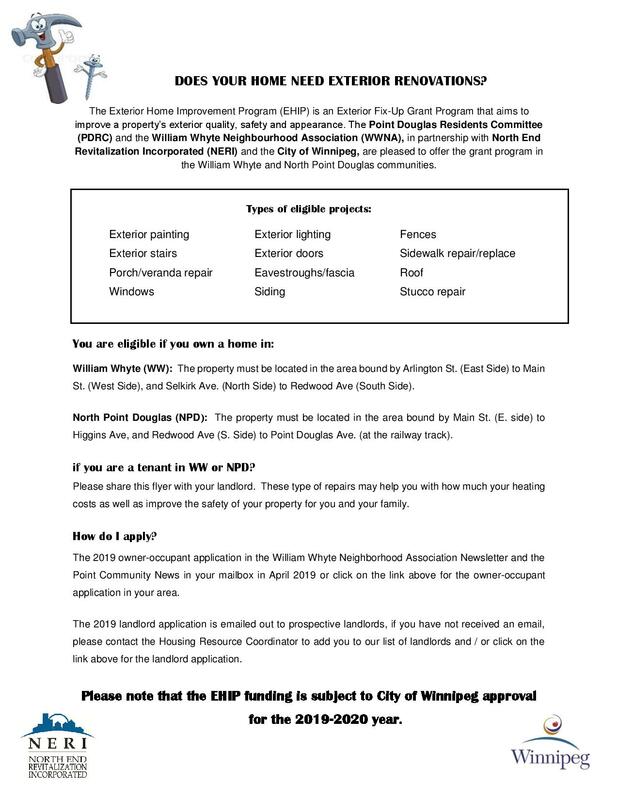 The Point Douglas Residents Committee (PDRC) and the William Whyte Neighbourhood Association (WWNA), in partnership with North End Revitalization Incorporated (NERI) and the City of Winnipeg, are pleased to offer the grant program in the William Whyte and North Point Douglas communities. The owner-occupant application deadline is May1, 2019 and the landlord application is May 8, 2019. Watch for an application in the William Whyte Neighborhood Association Newsletter and the Point Community News in your mailbox in April 2019. Please note that the EHIP funding is subject to City of Winnipeg approval for the 2019-2020 year. If you have any questions, please contact Roxane Dorvault, Housing Resource Coordinator at 204-927-2341 or housinggrants@necrc.org.